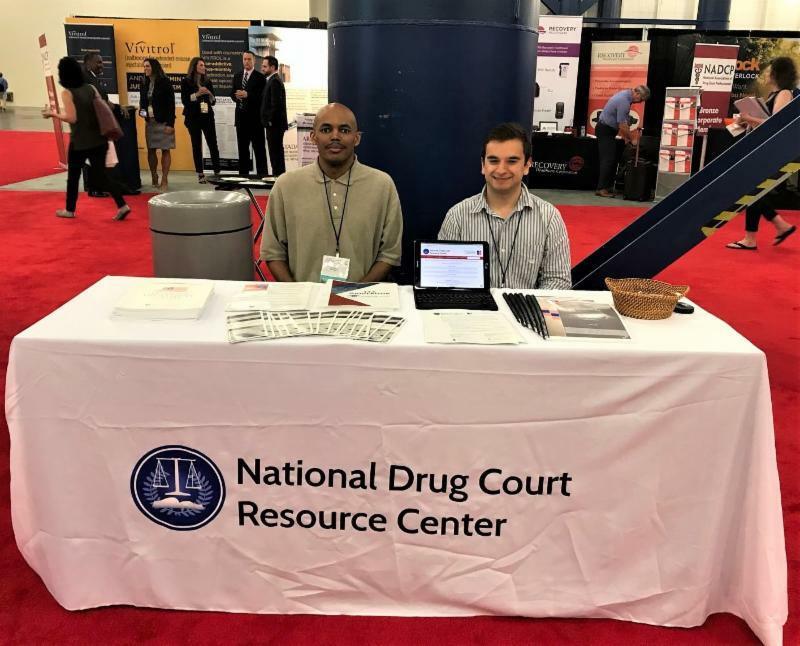 At the close of May’s National Drug Court Month, the NDCRC team joined practitioners, judges, attorneys, and other nonprofits at the National Association of Drug Court Professionals' annual conference in Houston, Texas. We enjoyed meeting treatment court teams from across the country and connecting them with our resources relevant to their work. Members of the NDCRC team also shared their individual areas of expertise in several workshop sessions. The workshops generated a lot of interest, and if you would like to receive the PowerPoint presentations for the sessions “ Effective Communication and Media for Drug Courts ” or “ The 2017 Drug Court Review: A Discussion with the Authors, ” please email us at ndcrc@american.edu . Measuring the success of your drug court is important for several reasons. You should be able to support your claims of being an effective diversionary program with numbers and data. Analyzing outcomes can help you identify the areas in which your court could improve and highlight the areas in which your court is serving your clients well. One of the most important measurements of your court's success is the long-term quality of life of your graduates. Mona Summer, Consultant at Addictions Consulting Group, and Statewide Drug Court Coordinator of Montana Jeffery Kushner have developed a process for following up with your graduates and collecting information about their quality of life based on research by Dr. Michael Dennis of Chestnut Health Systems . Their guide, called Recovery Maintenance Check-In , also provides your staff the opportunity to continue to support graduates in their recovery by re-affirming coping strategies and providing recommendations for continued services. Research has shown that maintaining contact with graduates, particularly during the 90 days post discharge from drug court, can have a significant impact on the prevention of relapse and re-offense and the maintenance of recovery. Find the Recovery Maintenance Check-In here . In 1989 a revolutionary approach to justice was realized in a Miami courtroom as a response to the city’s battle against a cocaine epidemic. Since then, treatment courts have been established throughout the country, the treatment court model has been adapted to be responsive to different populations and cultures, and they have proven to be one of the most effective diversionary programs in the criminal justice system. The National Drug Court Database provides a rich picture of today’s diverse landscape of treatment courts. The database includes over 3,400 drug treatment programs and information on the 197 Bureau of Justice Assistance grants supporting the field. Ex plore the data base by state, court type, and key phrases. For over two decades, the treatment court community has come together each May to shine a light on the unparalleled success of adult drug courts, juvenile drug courts, family dependency treatment courts, tribal healing to wellness courts, DWI courts, and veterans treatment courts. National Drug Court Month is our greatest opportunity to demonstrate the collective impact of these life-saving programs and send the powerful message that they must be expanded. This year, treatment courts and the lives they saved were featured in more than 500 stories in national, state, and local media. Read more here . The National Association of Drug Court Professionals' (NADCP) Adult Drug Court Best Practice Standards state that citizens who have historically experienced sustained discrimination or reduced social opportunities because of their age, ethnicity, gender, sexual orientation, sexual identity, physical or mental disability, religion, or socioeconomic status must receive the same opportunities as other citizens to participate and succeed in treatment court. NADCP, through its National Drug Court Institute division, is now offering free equity and inclusion training to all treatment court models. This one-day training is available on demand . Learn more and apply . In case you missed Children and Family Futures (CFF) at NADCP's annual conference, click here to view the CFF program and download presentations that focus on better meeting the needs of children and families. CFF's sessions cut across all types of drug courts to bring a family focus to treatment and recovery. CFF also explored opportunities to apply what works in family treatment courts (FTCs) to the larger child welfare population in a continuum of care. By applying FTC strategies and practices to other services, the treatment court field can be a part of larger system change in states and communities across the country and give all families access to the services they need. Re-scheduled! The second webinar of the National Family Drug Courts Training and Technical Assistance Program’s 2018 Learning Academy is rescheduled for July 26, 2018 at 11:00 a.m.-12:15 p.m. PT. This webinar will focus on developing supportive systems for families affected by the opioid epidemic, including pregnant and parenting women and their infants with prenatal substance exposure . Learn more here. The Tribal Law and Policy Institute has released a new publication. Tribal Healing to Wellness Courts: Case Management (2018) provides wellness courts and their staff a guide to effective case management and the case manager role. This resource discusses drug court case management standards, the functions of case management within a wellness court, the models and ethics of case management, data and evaluation, and how the role of case management can be functionally and ethically shared by other members of the wellness court team. The appendix of this publication includes models of case management, vicarious trauma, sample job descriptions, sample participant progress reports, and sample wellness court data values. The National Drug Court Resource, Policy, and Evidence-Based Practice Center ’s mission is to equip the drug court field with open access to a wide variety of resources and research, helping treatment courts run more effectively. Please email ndcrc@american.edu with any inquiries.